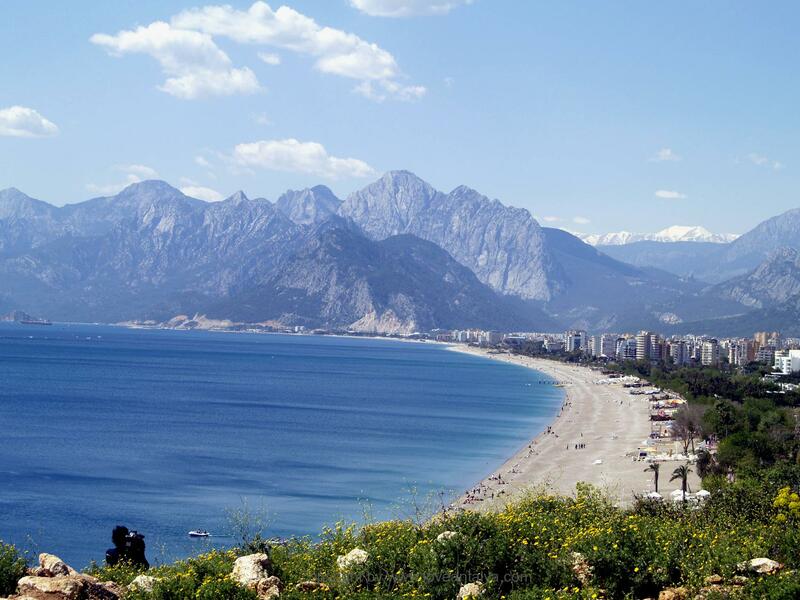 It might not be everybody, who agrees with me, that Konyaalti is the city’s best beach in Antalya, everyone has their preferences, but the beach fully lives up to my wishes and I want to tell you why. Because I ‘m sure that you too will find one or another spot on the long beach, that suits you. See that’s one of the advantages with a long beach, there are various areas along the shore and things evolve, when you have enough space. 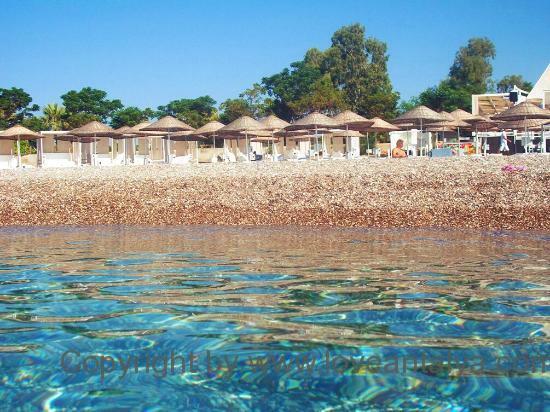 Fortunately, there is room for the most, when you have a beach that is just over 3 km long and stretches from the town and out west to the big industrial harbor at the foot of the mountains. 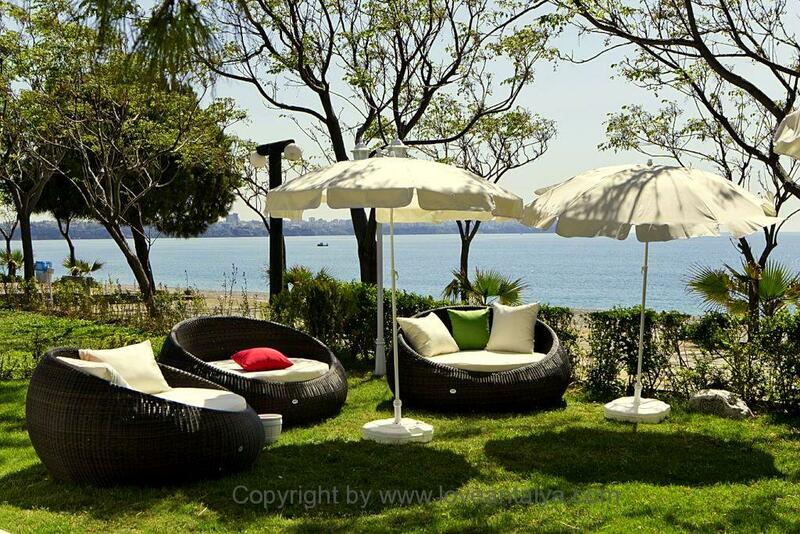 It is not for nothing Konyaalti is called “The people’s beach”, because it is really a beach for everyone. We have come to the beach for decades and have seen, how it has evolved from being like any other random beach without much fuss to be a regular beach park. Furthest to the east (and closest to the city) you’ll find a regular beach park, where there are plenty of offers, cafes, tea houses, playgrounds for children, trampolines, water sports, volleyball, partying. Many of these places belong to the large luxury hotels like Sheraton and Hillside Su, and you have to pay an admission fee to get down to the beach and use their facilities (I think it’s about 17 TL per. person). It’s not exactly cheap, but is definitely worth a try if you like pampering, extra fussiness, magnificent four-poster beds, good food and service. The place is perhaps not so much for the kids, but give it a try. In these areas there is also a large guarded parking, where you pay a little to get into. If you are with dolmus (the small local buses), you can get off right outside the park or take the tram from the town towards the museum, get off there and then walk 10 minutes down the hill. We always runs in the car or come by taxi, so it’s so easy – hurray for laziness, while on holiday 😉 There is especially cozy in this area at night. You can find several tiny eateries, unfortunately they serve “tourist food “, but they use to be okay. In several places they have decorated a small garden surrounded by palmtrees and flowers, so you completely forget, that you’re at the beach (except for the smell and the sound of lapping waves). The atmosphere, the joys, the sound of the waves, chattering people, children playing and colored lights just take it to a higher level. We usually sits here at night to get some fruit, dessert, a cold beer, some nuts or a cup of Turkish tea. We have the most wonderful memories from here, so we can warmly recommend the place. If you go further west – towards the mountains, the many offers fades a little more and becomes a little less intense. Just after the hotels’ beach park you can still find many activities and loud music. Here there is usually an opportunity for paragliding, sailing, banana boats and pedal boats, but also on land there is a buzz of activity. Volleyball is particularly popular. All places along the beach there are showers with fresh water – a really nice offer, now that the water is as salty as the Mediterranean and you sweat just lying still. 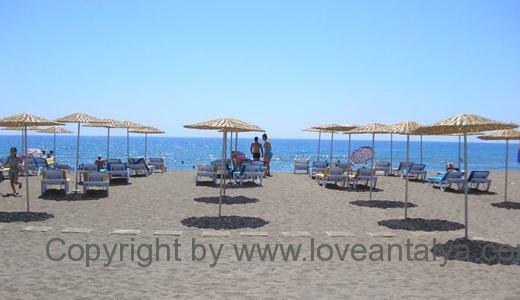 At all places you can be offered sun loungers and a parasol ,and prices vary according to how far down the beach, you are. Expect between 8 and 15 TL per person for a full day. Most sites have a small restaurant, and it is also something so wonderful to be able to go up and get some food or have it brought down with cold drinks. You easily get a bit lazy when the temperature outside the parasol says 40º C. However, please be aware that you usually cannot bring your own food or drinks into these areas (so it often gets a bit expensive if you buy food and water for a whole day). Sometimes we sit completely outside the areas with sun loungers – especially if we’re just down for a quick dip (especially recommended at sunrise or sunset). Here are generally quieter, not as much celebration and loud music, and it’s also where you’ll find many Turks, who come to cool off on top of a hard working day. There are also many familie, who have packed for the big picnic. Turks ADORES picnic in all forms. Try to follow their example – it is really nice to have a picnic on a beach. If you live in a place, where you can’t cook, you can buy something and go. Try eg. the super delicious things, they have at the delies in the larger supermarkets. You will not find anything more authentic Turkish than these small dishes, a little cheese and tomatoes, a little olive and a good bread. Konyaalti has stones all over the place – and it’s not everyone who likes this. Personally, it’s fine by me. I care any less about having sand all over the place (especially if you also need to eat on the beach). 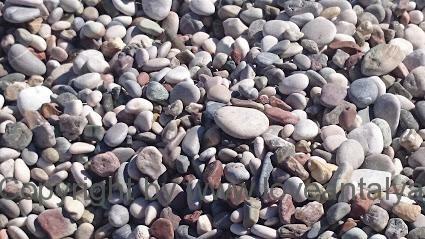 The stones are fortunately not big rocks, but smaller pebbles rounded by the waves and the huge forces. Like the sand, however, they are absolutely burning after a long day in the sun, so remember flip-flops suitable to go right into the water. For believe me, you do not want to leave your shoes before you’re less than a step from the cooling water. Besides this, the beach is reasonable for children. Antalya is built on rocks, so it gets deep very quickly when going out in the water (and the waves can be a little big, if you come at noon). So keep an eye on the kids! After all, you can spend hours here (and the kids will be so tired afterwards). All along the beach there have been built a large, fine promenade with tiles, so you can take a good walk (or run if you are plagued by guilt over your holiday excesses). Many like to promenade here, showing off, exercise, teach children to ride a bike, take a walk with the stroller and showi their youngest heir-up, chat with friends, skating etc. To the east there is nevertheless nicest and fine trees along the road while to the west are views of the dramatic Beydaglari mountains. Have you now got a sense of why I love this particular beach so much ? ?